A replacement for a healthy low calorie diet and consistent exercise program. 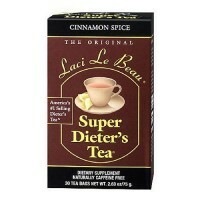 Laci Le Beau Super Diter's Tea is America's #1 Selling Diester's Tea. Super Dieters Tea Lemon Mint contains a caffeine-free blend of herbs, leaves, and spices having a citrus flavor and a hint of peppermint and supports the body in reducing weight when combined with a healthy diet and exercise. Nutritious dietary plan enclosed. Natural lemon mint. The original. Super Dieter's Tea from Laci Le Beau is the result of painstaking research and experimentation with hundreds of herbs, leaves, and spices. Laci Le Beau Master Tea Blenders combined ancient Chinese wisdom with American ingenuity to create a refreshing tea of unequaled flavor and aroma. For thousands of years people of the Orient, India and Greece have utilized various herbs in their daily diets. Many of these original recipes have been handed down for generations and are still enjoyed today. 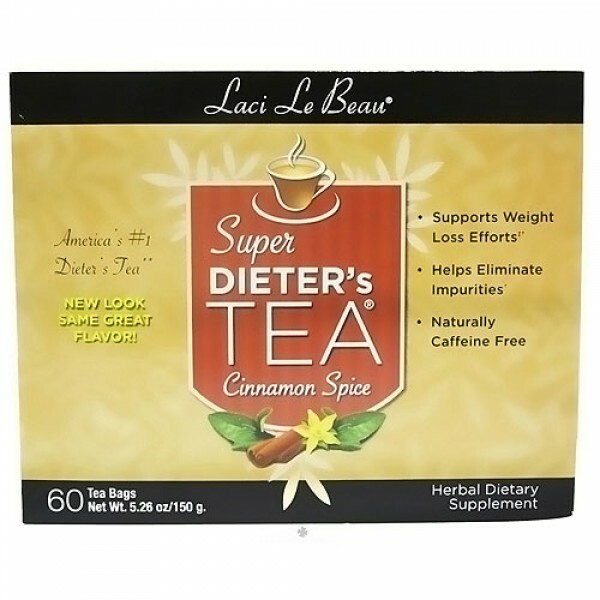 Super Dieter's Tea is a premium blend of natural herbs and spices. Laci Le Beau master tea blenders make sure every cup of Super Dieter's Tea meets the rigorous quality standards that continue to satisfy millions of people everywhere. Demand the best Super Dieter's Tea. Since everybody is unique, you should start with a small amount of Super Dieters Tea and gradually increase your intake. As with any new weight management program, it is always advisable to check first with your health care provider. Discuss your weight related goals, reduced calorie diet and exercise program, and seek appropriate advice especially if you have or suspect a medical condition, are taking prescription drugs or are pregnant or lactating. Remember, Laci Le Beau Super Dieters Tea is not a replacement for a healthy low calorie diet and consistent exercise program. It's an occasional supplement to help you work toward your immediate goals and should not be taken for more than 10 days at a time. You can, of course, use Laci Le Beau Super Dieters Tea on a cyclical basis to help you work toward and maintain your weight management goals. Get support: Check with your physician before starting any weight management plan. Make a commitment: Permanent weight loss requires time and effort. Commit to lifelong changes for good health. Set realistic goals: Healthy weight loss is 1-2 pounds per week. Eat frequently and dont skip meals: Eat small, frequent mini-meals to help your body efficiently burn calories. Skipping meals will cause your body to hold onto fat rather than burn it. Enjoy healthier foods: Choose fresh fruits and vegetables, whole grains, beans, nonfat yogurt, nuts and seeds, and high fiber cereals. Cut out the junk: Avoid or minimize sugary, fatty, processed, and sodium-rich foods. Get active and stay active: Exercise a minimum of 30 minutes, 3-5 days a week. Stay hydrated: Drink a minimum of eight 8oz. glasses of water per day to help your body function at its best and to help control hunger. Give your body the nutrition it needs:Take a daily multivitamin. Keep a positive mental outlook: Dont be too hard on yourself. Being healthy should be fun! Cinnamon bark, cinnamon spice with other natural flavors, orange peel, marshmallow root, eleuthero root, licorice root, papaya leaf, chrysanthemum flower, Japanese honeysuckle flower. Pour 12 oz. boiling water over tea bag and let steep for 2 minutes. Do not over steep! Press tea bag gently and remove. Drink one 6 oz. cup after your evening meal, saving the rest for the following day (may be enjoyed hot or cold). 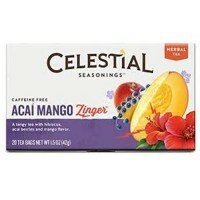 Three or four days later you may increase the strength and flavor of your tea-if you wish-by brewing with 6 oz. of water. It is important not to have more than one cup in a 24 hour period. Do not take for more than 10 days unless directed by a doctor. This product contains Senna. Read and follow directions carefully. Do not use if you have or develop diarrhea, loose stools, or abdominal pain because Senna may worsen these conditions and be harmful to your health. Consult your physician if you have frequent diarrhea or if you are pregnant, nursing, taking medication or have a medical condition.